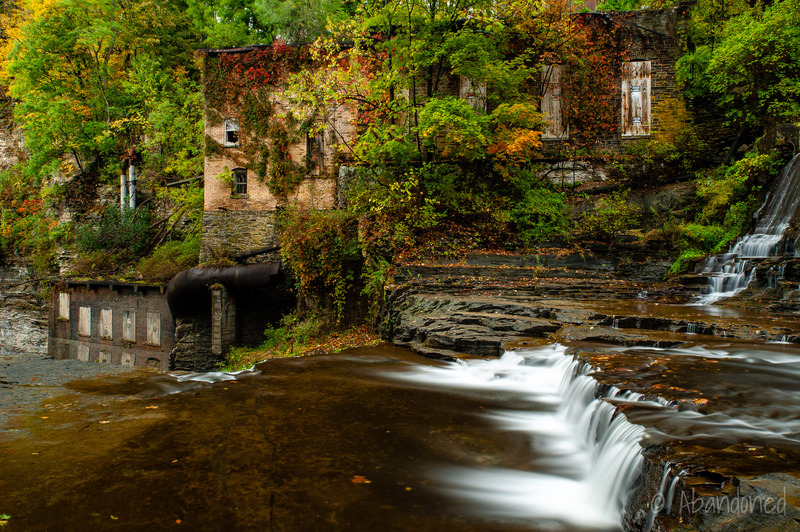 The Van Nattas Pumping Station is an abandoned pump station and mill in Ithaca, New York. It was constructed by the Ithaca Light & Water Company. By the late 19th century, groundwater sources from numerous wells were not enough to meet the needs of the growing city. Three reservoirs were constructed on Six Mile Creek between 1892 and 1911. 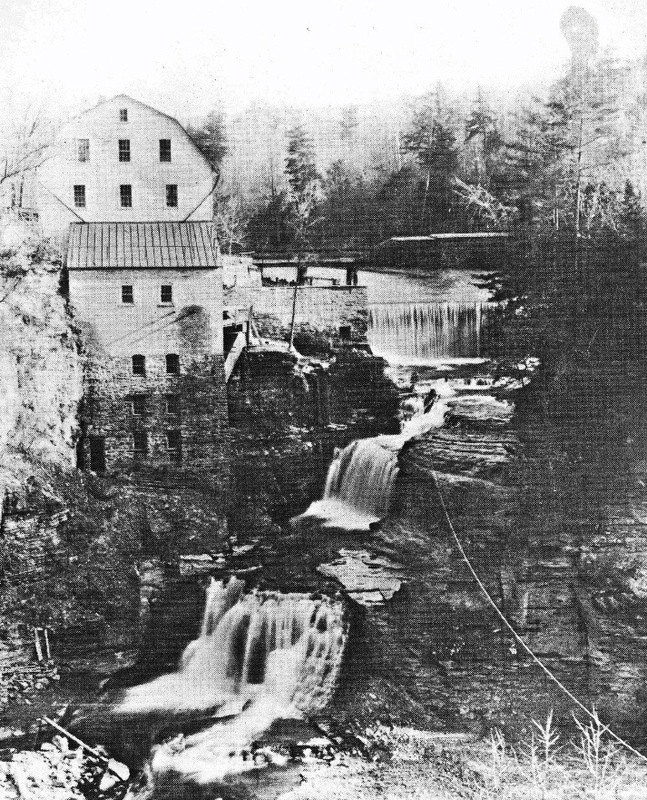 The first, a 20-foot dam at Van Nattas along today’s Giles Street, was purchased by the Ithaca Light & Power Company in 1892.1 2 A pumping station was constructed a year later 3 4 on the site of the Van Natta & Jones Mill.5 The mill produced seven grades of flour. In 1901, the first water storage tank in the city was built at Mitchell Street.4 The site was later used as the playground of Belle Sherman School after the tank was razed in 1937 in favor of a larger facility on Cornell Street. 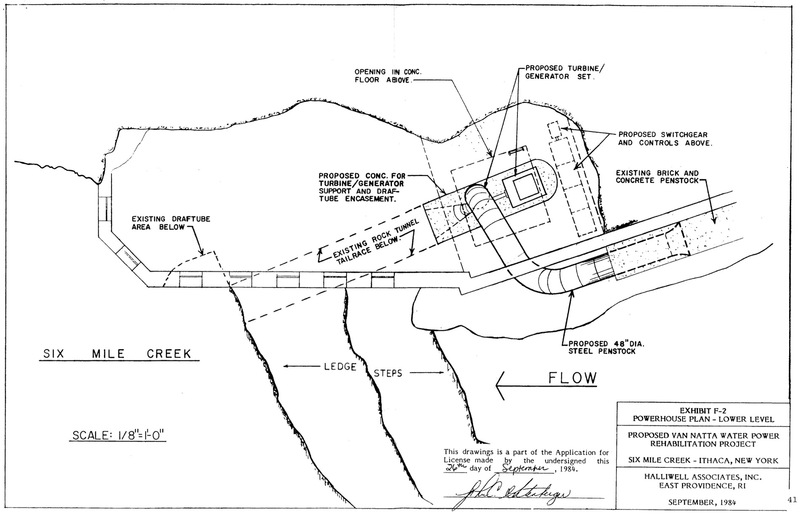 The utility followed up by drilling six artesian wells in Inlet Valley at the cost of $125,000 a year later.4 The wells were not very productive; to compensate, air compressors were installed at the pumping station to increase the flow. Frustrated, the Ithaca Water Company made plans to construct a 90-foot dam just upstream of the pumping station.4 It was soon downgraded in scope to 30-foot in height. The company then installed a 24-inch cast-iron aqueduct along the creek to supply water to the pumping station from the newly formed reservoir. Additionally, one-hundred new fire hydrants and new main water lines were installed throughout Ithaca. 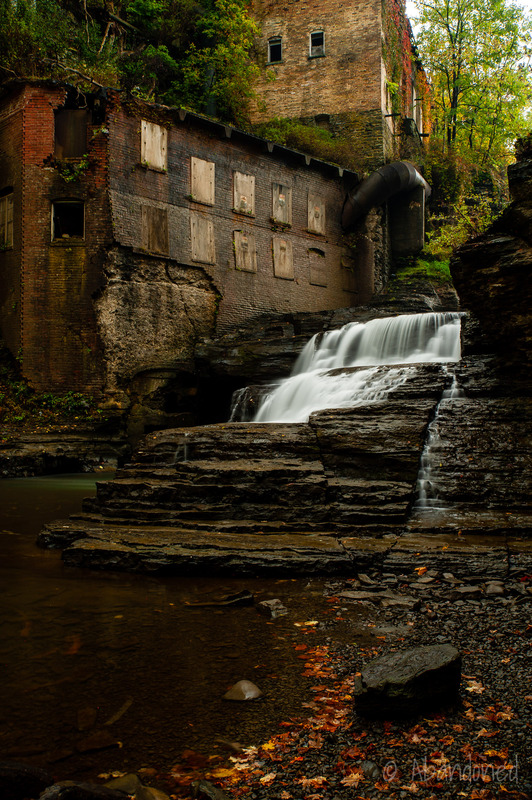 In January 1903, Ithaca was ravaged by the typhoid epidemic, which resulted in 1,350 cases and 85 deaths.4 It was ascertained that those who drank from the new reservoir suffered from the outbreak due to the unsanitary conditions that were found during the construction of the dam. On March 2, the city voted to construct a purification plant for the town and plans by Allen Hazen, in cooperation with Gardner S. Williams and the New York Continental Jewell Filtration Company, were drawn up by March 12. Construction on the new purification plant began on March 27, and it was operational by August 19.4 It featured two coagulation basins, each with a 218,500-gallon capacity, six rapid-sand filters of 500,000 gallons each, and a pure-water basin of 500,000 gallons. The coagulation, aluminum sulfate, commonly referred to as Filter Alum, was dissolved in two 1,700 gallon tanks, where it was then raised to a small distributing tanks by bronze Pelton centrifugal pumps. During this time, the city drilled nine wells on West Clinton Street to a depth of 300 feet.4 The wells delivered approximately two million per day difficulties in their operation were soon apparent. Additionally, the larger wells were siphoning water from private wells, leading to lawsuits filed against the city by adjoining landowners. The wells were subsequently abandoned in 1907. In 1906, the city installed more powerful pumping machinery at the pumping station.4 It allowed for additional water pressure and resulted in the main water line being constructed across Fall Creek at Triphammer Bridge to Cornell Heights. Minor concrete repairs to the dam. Modifications to the existing intake structure with new wood planking, trashrack, and gate. Perform brick and concrete repair to the existing penstock, which measured the 8-feet diameter and was 58-feet long. It was brick lined and concrete capped. The existing penstock would interface with a new steel 4-feet diameter 67-feet long penstock. A portion of the existing 6-feet diameter steel penstock would be removed. Install a new control room in the former turbine and generator room on the second level of the structure. Construct a new turbine generator room at the beginning of the existing rock tunnel tailrace. Install a new 90-foot underground and 20-foot overhead transmission line. 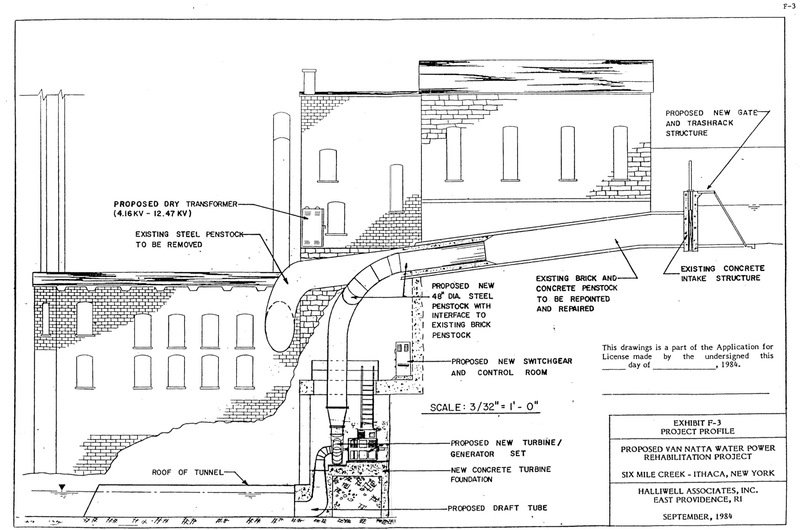 The proposal called for a new turbine and generator room directly below the existing pump turbine and generator room.6 The new turbine and generator room would be installed near and at the beginning of the rock tunnel tailrace. Flow to the turbine would enter through a new trashrack gate structure, through the penstock, and into the turbine inlet. 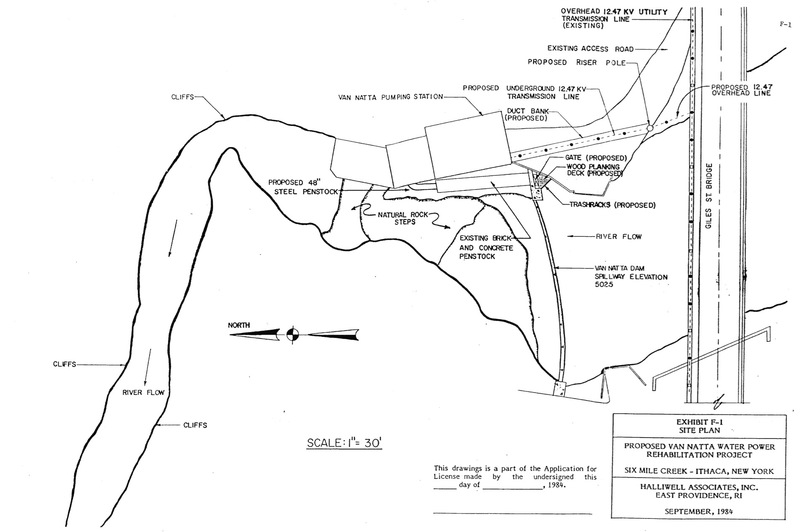 The plant would operate on a “Run of River” mode where all inflow will equal outflow, and be capable of producing between 20 CFS to 100 CFS at an average of 56.75 feet with an installed capacity of 400 kw.6 Between March and May, a continuous flow of nine CFS would be released over the spillway to provide downstream migration of salmon. During the remaining months, four CFS would be released over the spillway to maintain the aesthetics of the waterfall. 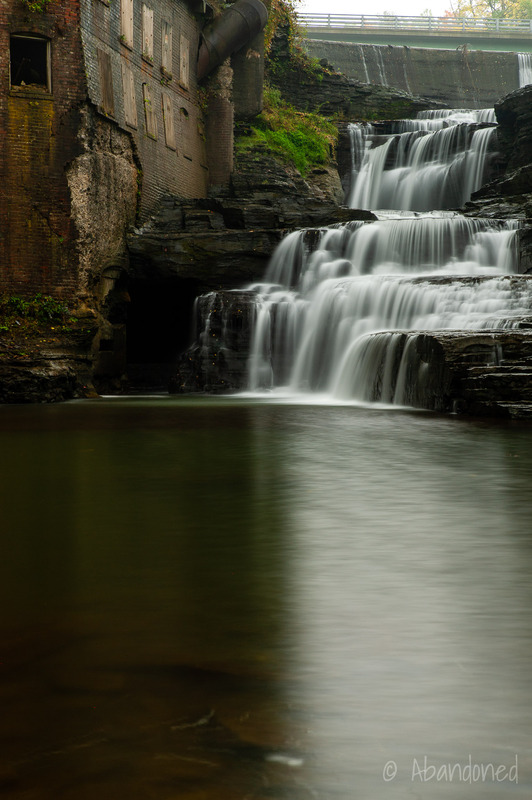 “Six Mile Creek Watershed.” Ithaca, NY – Official Website. City of Ithaca, New York. Web. 1 Dec. 2015. Article. Flood Mitigation Needs Assessment, Six Mile Creek, Tompkins County, New York. Pub. no. 2343-01. Cheshire: Milone & MacBroom, 2003. City of Ithaca, New York. Web. 30 Nov. 2015. Report. “Ithaca.” Documents of the Senate of the State of New York. 27th ed. Vol. 15. Albany: J.D. Lyon, 1910. 402-403. Print. Harris, Dorthy. History of Ithaca’s water systems. Ithaca: City of Ithaca, 1952. Print. “Buffalo.” The Northwestern Miller 29.1 (1890): 82. Print. Supplemental Information Package, Van Natta Dam Water Power Rehabilitation Project. City of Ithaca, Jun. 1989. Print.